I am back from Italy again! A week in the Italian Dolomites shot by way too fast again (like every time before). This year we had a little bit of sunshine, a bit of snowfall and lots of cold - freezing cold actually. All week long we were listening to almost apocalyptic news on Italian TV programs. It was all about the Costa Concordia disaster and weather problems throughout the country. Titles like "Italia blocata" were all too common. Actually we got quite lucky with the weather. Dolomites were a part of Italy with surprisingly the nicest weather for all week long. Also those reports were usually quite exaggerated. By my standards anyway... Italians seem to do this a lot. For instance there was about 2 centimeters (1 inch) of snow in Rome and reports of total chaos were aired on the evening news. I agree any snowfall is quite unusual in those parts and it can lead to substantial traffic problems, but a couple centimeters of snow during the night is no end of the world in my book. Me being from a place where snow is quite an usual sight every winter also didn't help me understand the "catastrophic proportions" of events. All of that did not influence our skiing enthusiasm. Despite of a couple of days of snowing and being pretty cold all the time, everything was fine. Mostly it was around -10°C (that is 14°F) or colder. A few days were really beautiful and sunny but cold nonetheless. 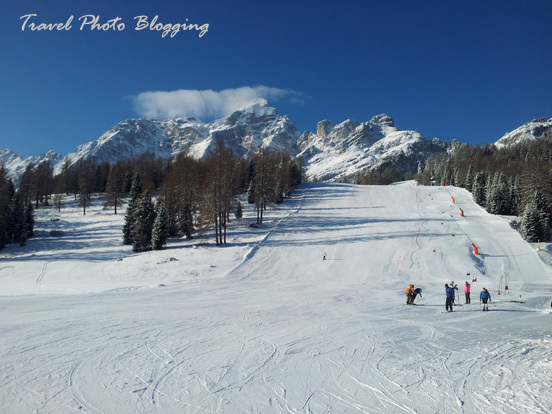 Mostly we were skiing in the Civetta ski area. Only for one day we decided to try out some new slopes and drove to Kronplatz, which is supposedly the most modern of the Dolomiti ski areas. That is probably true - almost all of the lifts are new cabins - some even with heated seats. All that is unfortunately a strong magnet for the crowds. Kronplatz gets pretty crowded throughout the whole season. I did about 50 kilometers (31 miles) of skiing per day - for six days in a row. 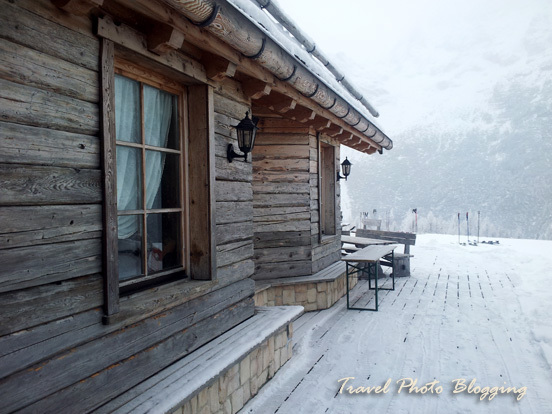 I must admit there were quite a few warming-up stops every day in many of those charming mountain huts placed just next to the slopes. Mostly they are made of wood - roof tiles and gutters included, and fit into the surroundings perfectly. 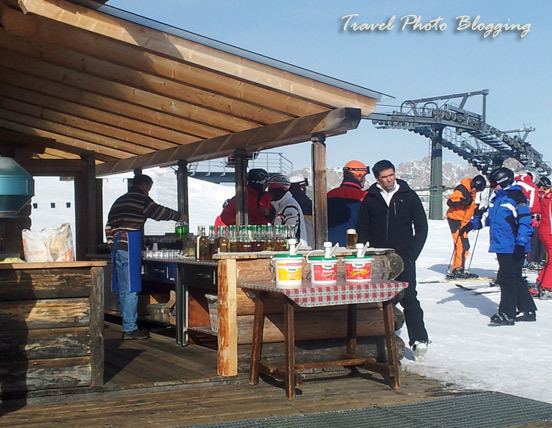 In some cases you could actually ski directly up to a bar and order something to help you warm up. All that together with the breathtaking views of the Dolomites can make you quickly forget the cold and simply enjoy every moment of the experience. How to choose the right accommodation in London?